My GGG-Grandfather Ananias Thomas was born in 1779 and lived a long and prosperous life near the banks of Richardson Creek in upper Union County NC. He married a person named Sarah whose maiden escapes record. Both Ananias and his wife outlived most of their children. Living on the creek when the American Revolution swept through the region, Ananias wrote his will in 1860 and died 16 Feb 1861 at the start of the civil war. His grave stone (above) at the Edmond Davis Cemetery is barely readable today. Ananias’ wife Sarah died in 1867 and her estate papers list all the heirs including my own great grandfather George. 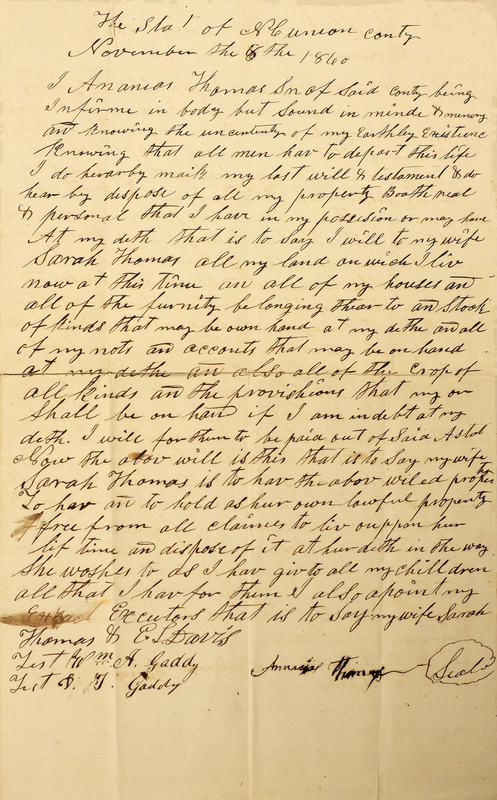 Rather than fill you with more computer generated font, below are images of Ananias’ last will and testament along with his wife Sarah’s estate papers. Take a look, imagine the shaky old hand using a quill pen to sign his last living directive. Read and imagine what kind of man he was. And look through Sarah’s papers and see if you can find your way back to Ananias and Sarah. I want you to see the past like I do …it’s a puzzle full of mystery, written mysteriously in a language all but gone. Enjoy and may you look forward to a happy and blessed new year!